The Taking of Christ (After Caravaggio) • Joe Forkan 2012, Conté crayon and graphite over etching and aquatint on paper, 13.25" x 23.75"
The Art Auction Preview begins Tuesday 31st, 11:00 a.m.-5:00 .p.m. at the Laguna Art Museum. Admission to the Preview is free. The Art Auction is 6:00-9:00 Saturday Feb. 4, 2012. More info can be found on the Laguna Art Museum’s Auction website. This reworked early stage etching is included in the Laguna Art Museum’s Auction 2012. The etching has been underway for some time and the final stage is being printed right now. I will post more information and images soon. 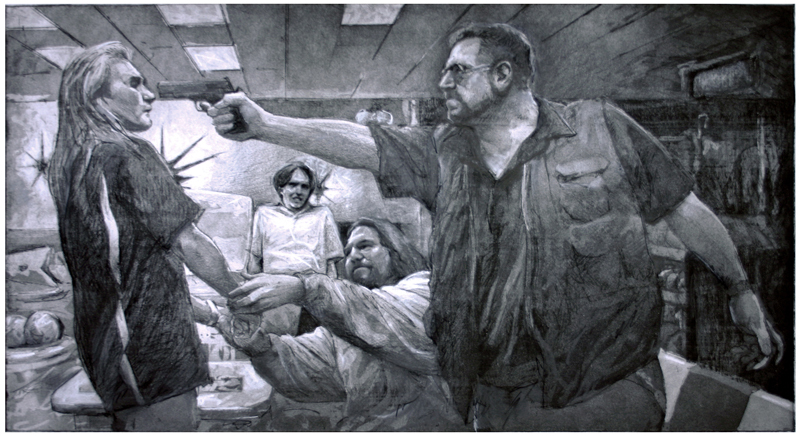 This entry was posted in Exhibitions, Figurative Painting & Drawing, Prints, The Lebowski Cycle and tagged aquatint, Caravaggio, Conté crayon, etching, graphite, Laguna Art Museum, The Big Lebowski, • The Lebowski Cycle on January 30, 2012 by Joe Forkan.